And it came to pass in those days, that the Philistines gathered their armies together for warfare, to fight with Israel. And Achish said to David, Know you assuredly, that you shall go out with me to battle, you and your men. And David said to Achish, Surely you shall know what your servant can do. And Achish said to David, Therefore will I make you keeper of my head for ever. Now Samuel was dead, and all Israel had lamented him, and buried him in Ramah, even in his own city. And Saul had put away those that had familiar spirits, and the wizards, out of the land. And the Philistines gathered themselves together, and came and pitched in Shunem: and Saul gathered all Israel together, and they pitched in Gilboa. And when Saul saw the host of the Philistines, he was afraid, and his heart greatly trembled. And when Saul inquired of the LORD, the LORD answered him not, neither by dreams, nor by Urim, nor by prophets. Then said Saul to his servants, Seek me a woman that has a familiar spirit, that I may go to her, and inquire of her. And his servants said to him, Behold, there is a woman that has a familiar spirit at Endor. And Saul disguised himself, and put on other raiment, and he went, and two men with him, and they came to the woman by night: and he said, I pray you, divine to me by the familiar spirit, and bring me him up, whom I shall name to you. And the woman said to him, Behold, you know what Saul has done, how he has cut off those that have familiar spirits, and the wizards, out of the land: why then lay you a snare for my life, to cause me to die? And Saul swore to her by the LORD, saying, As the LORD lives, there shall no punishment happen to you for this thing. Then said the woman, Whom shall I bring up to you? And he said, Bring me up Samuel. And when the woman saw Samuel, she cried with a loud voice: and the woman spoke to Saul, saying, Why have you deceived me? for you are Saul. And the king said to her, Be not afraid: for what saw you? And the woman said to Saul, I saw gods ascending out of the earth. And he said to her, What form is he of? 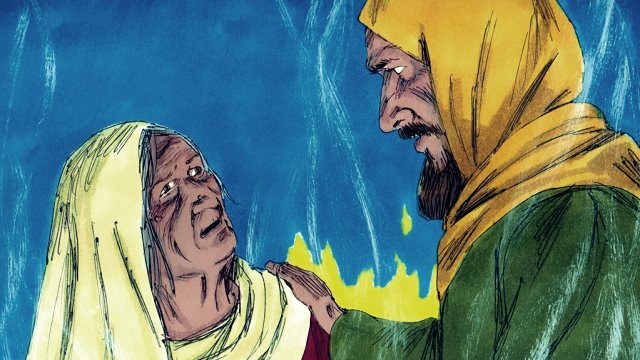 And she said, An old man comes up; and he is covered with a mantle. And Saul perceived that it was Samuel, and he stooped with his face to the ground, and bowed himself. And Samuel said to Saul, Why have you disquieted me, to bring me up? And Saul answered, I am sore distressed; for the Philistines make war against me, and God is departed from me, and answers me no more, neither by prophets, nor by dreams: therefore I have called you, that you may make known to me what I shall do. Then said Samuel, Why then do you ask of me, seeing the LORD is departed from you, and is become your enemy? And the LORD has done to him, as he spoke by me: for the LORD has rent the kingdom out of your hand, and given it to your neighbor, even to David: Because you obeyed not the voice of the LORD, nor executed his fierce wrath on Amalek, therefore has the LORD done this thing to you this day. Moreover the LORD will also deliver Israel with you into the hand of the Philistines: and to morrow shall you and your sons be with me: the LORD also shall deliver the host of Israel into the hand of the Philistines. Now the Philistines fought against Israel: and the men of Israel fled from before the Philistines, and fell down slain in mount Gilboa. And the Philistines followed hard on Saul and on his sons; and the Philistines slew Jonathan, and Abinadab, and Melchishua, Saul’s sons. And the battle went sore against Saul, and the archers hit him; and he was sore wounded of the archers. Then said Saul to his armor bearer, Draw your sword, and thrust me through therewith; lest these uncircumcised come and thrust me through, and abuse me. But his armor bearer would not; for he was sore afraid. Therefore Saul took a sword, and fell on it. And when his armor bearer saw that Saul was dead, he fell likewise on his sword, and died with him. So Saul died, and his three sons, and his armor bearer, and all his men, that same day together. Now it came to pass after the death of Saul, when David was returned from the slaughter of the Amalekites, and David had stayed two days in Ziklag; It came even to pass on the third day, that, behold, a man came out of the camp from Saul with his clothes rent, and earth on his head: and so it was, when he came to David, that he fell to the earth, and did obeisance. And David said to him, From where come you? And he said to him, Out of the camp of Israel am I escaped. And David said to him, How went the matter? I pray you, tell me. And he answered, That the people are fled from the battle, and many of the people also are fallen and dead; and Saul and Jonathan his son are dead also. And David said to the young man that told him, How know you that Saul and Jonathan his son be dead? And the young man that told him said, As I happened by chance on mount Gilboa, behold, Saul leaned on his spear; and, see, the chariots and horsemen followed hard after him. And when he looked behind him, he saw me, and called to me. And I answered, Here am I. And he said to me, Who are you? And I answered him, I am an Amalekite. He said to me again, Stand, I pray you, on me, and slay me: for anguish is come on me, because my life is yet whole in me. So I stood on him, and slew him, because I was sure that he could not live after that he was fallen: and I took the crown that was on his head, and the bracelet that was on his arm, and have brought them here to my lord. 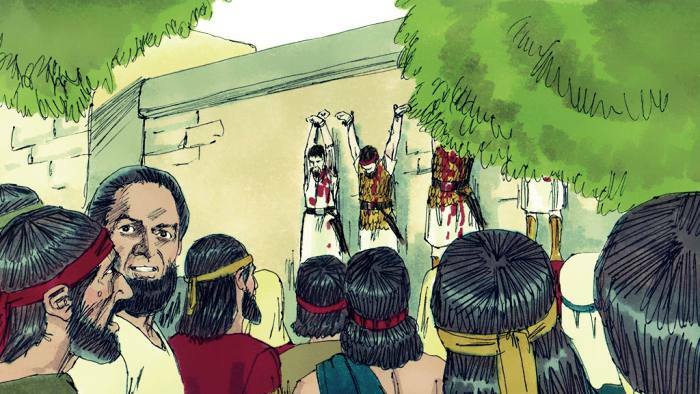 Then David took hold on his clothes, and rent them; and likewise all the men that were with him: And they mourned, and wept, and fasted until even, for Saul, and for Jonathan his son, and for the people of the LORD, and for the house of Israel; because they were fallen by the sword. And David said to the young man that told him, From where are you? And he answered, I am the son of a stranger, an Amalekite. And David said to him, How were you not afraid to stretch forth your hand to destroy the LORD’s anointed? And David called one of the young men, and said, Go near, and fall on him. And he smote him that he died. And David said to him, Your blood be on your head; for your mouth has testified against you, saying, I have slain the LORD’s anointed. The beauty of Israel is slain on your high places: how are the mighty fallen! You mountains of Gilboa, let there be no dew, neither let there be rain, on you, nor fields of offerings: for there the shield of the mighty is vilely cast away, the shield of Saul, as though he had not been anointed with oil. David Renews his Oath to Bathsheba (1 Kings 1:28-31) Then king David answered and said, Call me Bathsheba. And she came into the king’s presence, and stood before the king. And the king swore, and said, As the LORD lives, that has redeemed my soul out of all distress, Even..
Jonah’s Anger at the Lord’s Compassion (Jonah 4:1-11) But it displeased Jonah exceedingly, and he was very angry. And he prayed to the LORD, and said, I pray you, O LORD, was not this my saying, when I was yet in my country? Therefore I fled before to Tarshish: for..
Preparations for the Temple (1 Kings 5:1-12) And Hiram king of Tyre sent his servants to Solomon; for he had heard that they had anointed him king in the room of his father: for Hiram was ever a lover of David. And Solomon sent to Hiram, saying, You know how..
Jonah Preaches to the Ninevites (Jonah 3:1-4) And the word of the LORD came to Jonah the second time, saying, Arise, go to Nineveh, that great city, and preach to it the preaching that I bid you. So Jonah arose, and went to Nineveh, according to the word of the..